‘Horror and the Horror Film’ is a vivid, compelling, insightful and well-written study of the horror film and its subgenres from 1896 to the present, concentrating on the nature of horror in reality and on film. Horror films can be profound fables of human nature and important works of art, yet many people dismiss them out of hand. “Horror and the Horror Film” conveys a mature appreciation of horror films along with a comprehensive view of their narrative strategies, their relations to reality and fantasy, and their cinematic power. The volume covers the entire genre, considering every kind of monster in it – including the human. After defining horror and thoroughly introducing the genre, the text offers a rich survey of all of the horror film’s subgenres, before concluding with a look at the related genres of horror comedy and horror documentary. International in scope, its survey extends from the first horror films (1896) to the present, discussing more than 350 movies. 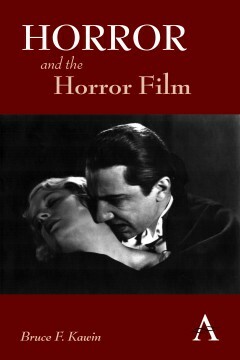 Through its comprehensive and detailed investigation of the genre, “Horror and the Horror Film” offers a compelling, insightful look at how the horror film frightens and revolts the viewer, its reasons for doing so, and the art of portraying and evoking fear, and will be a great asset to film scholars, horror enthusiasts and readers yet to be convinced of the importance of the genre. Bruce F. Kawin is Professor of English and Film at the University of Colorado at Boulder. His books include ‘Telling It Again and Again: Repetition in Literature and Film’, ‘Mindscreen: Bergman, Godard, and First-Person Film’, ‘The Mind of the Novel: Reflexive Fiction and the Ineffable’, ‘Faulkner’s MGM Screenplays’ and ‘How Movies Work’. He is also the co-author of ‘A Short History of the Movies’.